This 9-story, beige-brick apartment building at the top of Sutton Place overlooks the great Queensboro Bridge. 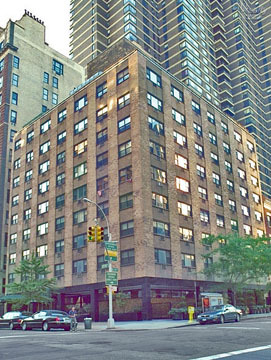 Built in 1954, the building at 40 Sutton Place, which is also known as 442 East 59th Street, has 74 apartments and was converted to a condominium in 1981. It has a polished black granite one-story base with a canopied entrance. The building has a doorman and discrete air-conditioners and no roofdeck and no garage. In a June 12, 1994 article in The New York Times, Bret Senft wrote that "in 1875, Effingham B. Sutton, who had shipped prospecting equipment to San Francisco during the Gold Rush, built brownstones for a residential enclave on the east side of what was then Avenue A between 57th and 58th Street." According to an article by Claire Wilson in the June 15, 2003 edition of The New York Times, Mr. Sutton had "bought a tract of East River bluff in the late 1870s, when the area was home to cigar and button factories and a number of breweries, and began building row houses on what was unglamorously called Avenue A." Ms. Wilson added that "Before his arrival, the surrounding area had ben the site of a Baptist immersing place and 'shot towers,' where bullets wre made." Mr. Senft's article added that Mr. Sutton's "residential dream quickly went bust because of the presence of industry and, by 1909, of the Queensboro Bridge and the New York Steam Corporation, whose stacks towered over Sutton Place at 59th Street." The bridge, which some observers consider the city's most beautiful and romantic, and one tall smokestack remain. After decades of having its great vaults used for storage, they were opened up and cleaned and converted into a large restaurant, Gustavino's, and a handsome supermarket in the 1990s, making the area considerably more attractive. It was a very long and difficult struggle, however, as Harley Baldwin first conceived of his "Bridgemarket" complex in 1977 when it got approval from the Board of Estimate but the project remained dormant for a decade when the city's Public Development Corporation granted the developer an substantial increase is permissiblespace but community protestors challenged the increase and it was not until 1994 that the New York State Court of Appeals found for the developer. 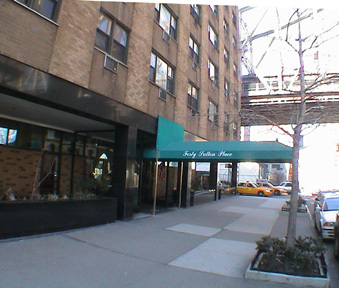 This boxy, mid-rise structure is the least attractive building on Sutton Place and Sutton Place South, but it has many good view and for many years a pre-school operated in the building. It is overshadowed, of course, by the bridge, but also by the Sovereign apartment building that rises mid-block just to the west 47 stories in a very dramatic stepped plan.